Browse Rite Aid Cyber Monday 2015 Deals and Sales. 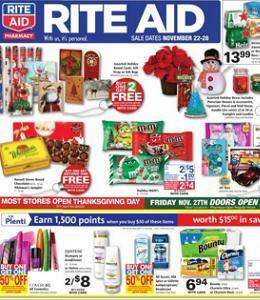 Complete coverage of the best Rite Aid Cyber Monday 2015 sales and online specials. The Rite Aid Cyber Monday 2015 will start on 11/29 and last till 12/4. Free Shipping for all orders $25 or more, offer valid 11/29-12/5. 12/5 – Member Appreciation Day 30% off for all w+ with Plenti members. BOGO free Vitamins and Supplements with card; BOGO 50% off Covergirl Cosmetics; BOGO free Rite Aid Pain Care and Allergy Relief. 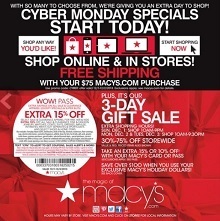 Find all Rite Aid Cyber Monday 2015 deals, sales & promotions on 1cybermondaydeals.com.